Downloading photos to your computer without organizing them is the digital equivalent of stuffing printed photos into shoeboxes. When you want to find a particular photo, you’ll have to sift through dozens, hundreds or (if you’re like me) thousands of photos. But if you’ll spend a few minutes organizing your photos when you download them to your computer, you won’t find yourself doomed to hours trying to find them later. No matter how easy it is to remember everything about a photo you’ve just taken, the more time that goes by, the harder it becomes to remember the details. Did you download those photos of the family reunion after the trip to Arizona or with the pictures from Jimmy’s birthday? And which birthday was that? While I’d like to say that there are free, simple organizing apps, many have been discontinued. Mac users still have a free option with the Photos app (which replaced iPhoto). Windows users may need to spend money to do it right. Windows Live Gallery used to be the best organizing and editing app, but it’s been discontinued. The current Photo Gallery for Windows can display photos but offers no organizational tools. Adobe Photoshop Elements ($59.99 on Adobe.com, $54.99 on Amazon) is easy and fast to use and worth the investment to ensure you can find those precious memories in the future. Save time and hard drive memory by making sure your camera’s date and time settings are correct and editing out the bad photos before exporting them to your computer. Check the date and time. Although you may have set the time and date on your camera when you first set it up, when you change the batteries or time zones, these settings can drift over time by minutes or hours. Go into the camera’s menu and check that the settings are still correct. This is especially important when you’re downloading photos from two or more sources such as your digital camera and smartphone or when you’re downloading photos from a friend. With correct date and timestamps, photos taken at the same time of the same subject will appear next to each other in your photo library, making it easier to browse to find your favorite photos. Turn on GPS. It’s surprising how quickly we forget exactly where a photo was taken. Many digital cameras have GPS, but leaving it turned on can drain the battery. If you’re going out for a long time, try taking the first couple of photos at your first location with GPS turned on. Then turn it off until you arrive at the next location. Rate and trash unwanted photos. Before you download anything to your computer, get rid of unwanted photos. Although you may want to save many photos of the same subject, there are some you’ll probably never want: pictures that are out of focus, extremely overexposed or underexposed, or unintentional shots of your hand or the inside of your bag. Many cameras offer an easy way to rate pictures. Some cameras let you add a heart or star to favorite the photo. 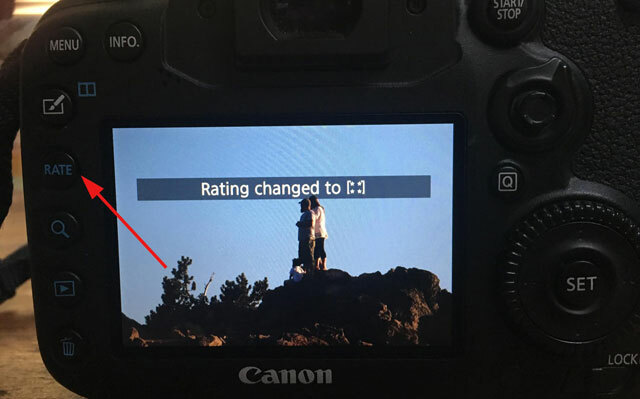 Look for a rating or favorites button when playing back the photos on the back of the camera. When you import the photos to your computer, the photo library software will transfer the ratings with the other metadata about the photo to help you find your favorites fast. Naming and tagging folders and photos are the keys to finding a single photo you are seeking. 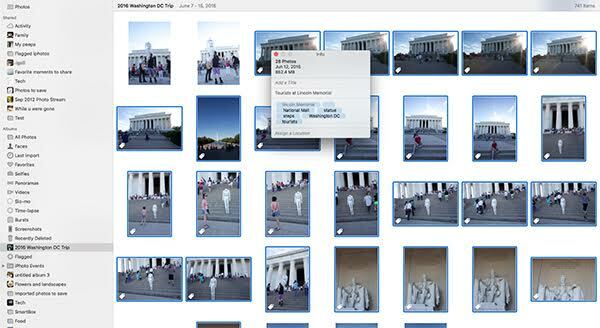 Use these five tips to make it easy to find your photos. Name the folders and save them to a special place on your computer’s hard drive. Try creating subfolders in the Pictures folder. Be consistent naming and tagging your photos with keywords you’ll remember and use. A tag or keyword can be a phrase or a single word. Don’t skimp when using keywords. Free associate to come up words that describe your photos. As you get ready to import your photos to your computer, think about the event, the subject and where the photos were taken. Add multiple keywords by using a comma between keywords in the image tag or keyword entry. Genre What is in the general theme of the photo? Try keywords like these: people, family, mountains, trees, rivers, city, flowers, birds, clouds, food, holiday, birthday, sports, dance, vacations, travel and concerts. Time of day, seasons Times and seasons can be helpful both as a descriptor and as a way of grouping photos for a period of time—for example, with keywords for winter, summer, spring or autumn. Searching for “autumn” might bring together photos from the start of school, Halloween and so on. “Night” could display all of the photos you shot at night. Specifics Name the event: “Sally graduation,” “Frankie soccer tournament,” “Southwest vacation,” “Thanksgiving,” “dinner,” “charity run,” “away games,” and so on. If you don’t take a lot of photos, you might be able to get away with more general keywords. The keyword “flowers” might pull up only a few dozen photos to look through. It may be easy to find the photo of the daisy without adding the word “daisy.” The more specific the keyword or tag, the easier it will be to find the exact photo you want. The Photos app is part of Mac OS X. 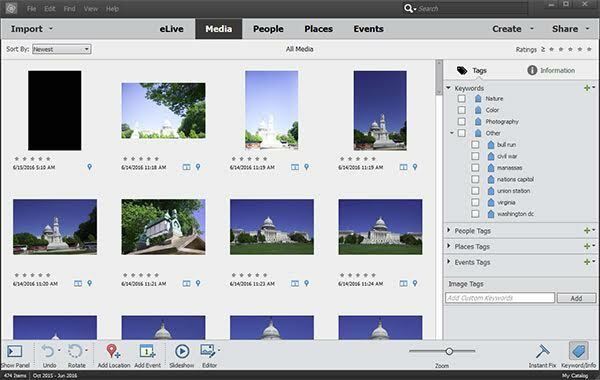 The app organizes your photos and offers basic editing functions. Photos from your iPhone and iPad are added here automatically along with the location of the photo. A single click lets you order prints and books or share a photo or album with your family. You can add keywords, facial recognition and location information to your digital photos in the Info window after importing them. To bring up the Info window, click on a photo (or group of photos) to highlight it (you’ll see a blue outline), and press Command + i(or go to the Window menu, then Info). Add a title. This names the file if you want to export and saves it in a folder on your computer. Add keywords. This is essential for quickly finding photos in the future. Favorite the photos. Clicking on the heart adds the photos to your favorites album. Add a location. If your camera doesn’t have GPS, add a location by typing in the city, state, country, landmark, theme park or other location detail. Photos will automatically suggest places; click on the best match. A pin will appear on the map below. Be sure to wait until the chosen location is filled out so it gets saved with the photo(s). You can adjust the location pin by dragging and dropping it. To find photos from a particular location, run a search for the place name. Add a face. When choosing a single photo, the option to add a face appears. Clicking on the + symbol displays a circle on the photo. Drag the circle over the face you are naming, and type in a name. If the person is in your contacts, you can choose the suggested name from a list. For photos that were previously imported, set aside some time to name the faces to make tagging easier in the future. Go to Albums, and click on the Faces album. This will be where you find the faces later. Buying Photoshop Elements may feel like a real investment ($59.99 on Adobe.com, $54.99 on Amazon), but it’s worth it. Elements is designed for the casual photographer (compared to Adobe Lightroom, which is designed for the enthusiast or professional). There is a 30-day free trial on Adobe.com, so you can try it out to see if it works for you (If you want to save the $5, you can enter the product key you get from your Amazon purchase after your free trial). Adobe Photoshop Elements is available for Mac too. Unlike Mac’s Photos app, Elements imports photos into folders so you can find them on your computer. This is handy when you want to save the photos to an external drive and connect that drive to another computer or directly to the USB port on your TV. Photo Elements has a number of built-in organizing tools that can be readily adjusted to regroup photos, making them easier to find. To start, choose Organizer in the welcome window. Choose where to save your imported photos. Do this in three steps. Click on Import. The Import window will open. It’s important to choose where to save your photos and name the folders. To do this, click on Advanced Settings in the bottom left of window. Under Import settings, browse to the location of the folder on your computer or external hard drive where your photos will be saved. The default is the Pictures folder. 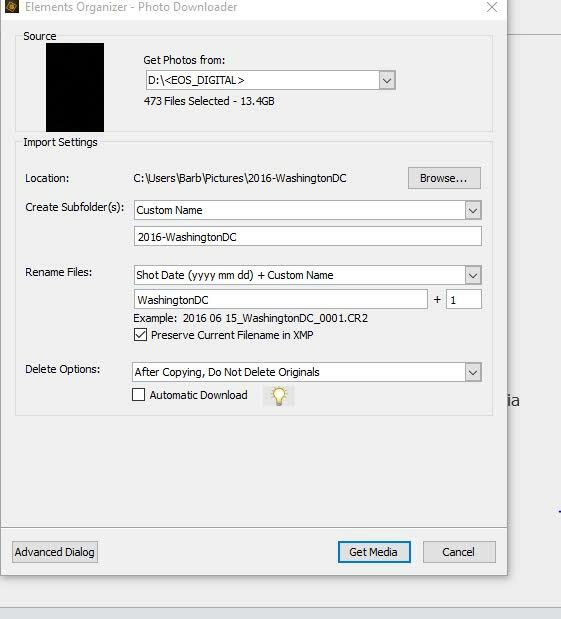 Create a subfolder for the current photo import. This will help you find the photos outside of the Photoshop Elements app. The default is to name the folders by date, but you may find it easier to remember the name of an event than when a photo was taken. Use the drop-down menu to choose Custom name. Name the folder for the event(s) that you are importing—“JohnnyRecital” or “Recital-Prom-Grad”—so you’ll be able to find the photos on your computer by searching for the folder. I like to create a hierarchy of folders. The top folder is my Pictures folder. The next folder is a broad subject such as “holidays,” “Oregon” or “around town.” I browse that folder in the location setting, then create a new folder for the specific event that I’m importing, such as “2016Thanksgiving.” When looking for files, I can go to the Holiday folder and find all of the holidays for all of years—handy if I don’t remember what year Johnny got the bike for Christmas. Create events with sliders. When taking photos, there may be days where you shoot one event in the morning and another in the afternoon. It’s easy to group and view these events separately in Photoshop Elements. Add a location to a photo or event. In the Places view, you can add a location to an event or group of photos by clicking on Add Location and then typing in a location. It takes a moment to appear. Choose the matching location from the suggestion list. A pin will appear on the map. Add a tag. For photos that cross events and locations, you'll want to add a tag. This can be as simple as food or sunsets. Add face recognition to photos. 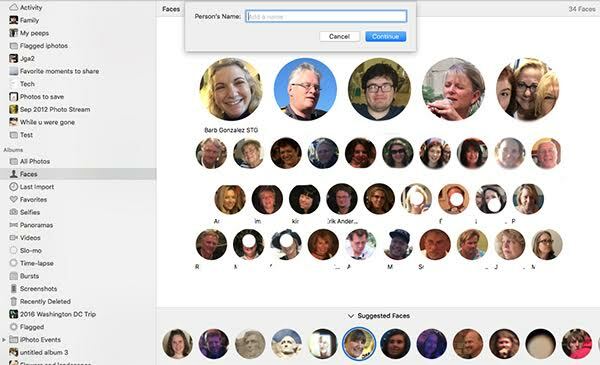 The People view will display unnamed faces found in your photo library so you can name them. It will suggest matching faces from other photos so you can confirm to add them to the group of photos of that person. Import photos after each event. 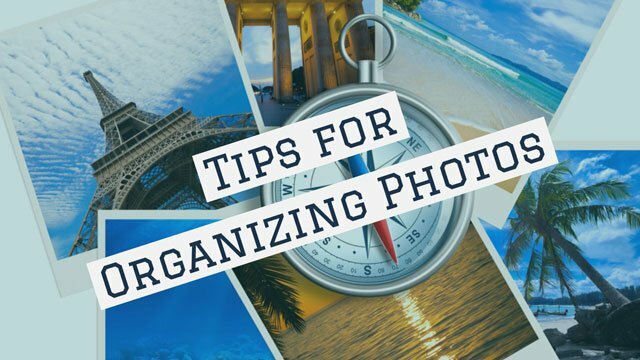 Organizing photos may seem like a lot of trouble, but it’s worth it. After a few imports, it will become a habit. 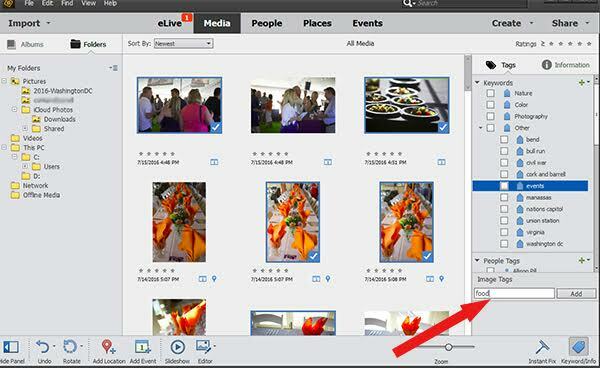 Importing photos after each event speeds up the process because there are fewer photos to tag and manage. You’ll also be more likely to share your photos with friends and family right after a big event. You can now download Picasa for Macs! I like this program more than iPhoto. I always used Picasa and still like it better due to its filtering and easy management options. But iPhoto renders photos better on the screen as compared to Picasa. To me it seems like Picasa converts images to low quality so that it could display them faster. That’s why now I find myself using iPhoto more often than Picasa. Thank you for these tips. Great timing with all the kid’s summer activities and our vacation. I needed this advice. Especially the reminder about setting the camera date and time. We got some pictures from our friend and they are all jumbled out of order! What about using Facebook? I post a lot of photos there and it’s been great. I use it like a photo album. Can you rely on Facebook as your sole photo album? It depends on whether you would be heartbroken in future years if those photos were gone. Near term, Facebook looks strong and permanent, and is paying significant attention to enhancing the photo sharing experience. But long term, (think a generation from now, if not a decade), no one can guarantee that Facebook albums will still be viable. That said, Facebook is improving the whole photo experience (at the possible cost of your privacy). As digital photos proliferate exponentially, managing them can be a humongous task. Facebook does that by default. It helps you automatically bubble up some of your most important photos over the years, based on the number of “likes”. And, your friends’ photos mix with your own to enrich the memories. Features like facial recognition could be used to speed searches. Given these benefits, it is certainly reasonable to embrace Facebook as a valuable tool in the photo management toolbox, though one that may be impermanent. Wisdom dictates that one should also keep photos in another location that is held personally. Thanks so much for this useful article. I wish I could keep them all in one place (namely, in “My Pictures” folder, but whenever I transfer them from my camera to my computer… they go wherever they want as I don’t see any provision where I could type where I want them. The result: I have real problem getting them. If someone could possibly have the step by step path for me to make sure all my pix go to only one place - to “My Pictures” folder, I’d be deeply grateful. This is in response to Adela’s question. Indeed, keeping the photos in one place is not always easy, but it’s so important! The best way to find a step-by-step guide is to search the Web for just that. The exact steps may vary depending on whether you have a Mac or PC, and how old it is (which determines its operating system), so you can specify that in your search if you know what operating system you have. Good work for asking how to do this! It will just take you 5 minutes to try it along with a “how to” video or article, then you’ll have it down pat. Meenakshi - You may be right! Thanks for sharing your feedback. If you are taking up better photo management habits, you might want to read about how to digitize your old videotapes and photo prints. https://www.techlicious.com/guide/best-photo-video-digitizing-services/ Enjoy your photos. I have over 5,000 photos and I know some are duplicates! The face recognition tip will really help me get rid of these…I think. Great article! There is a free app “Duplicate Cleaner for iPhoto” that works very nicely for getting rid of doubles. Guys, if you haven’t tried photozapper for sorting your photos you really should. Its really really simple and does just this one thing – helping you get your photos under control. You choose buckets for sorting the photos into, then do a full screen no distractions slideshow of your photos. For each photo you press a key to rotate, delete, or to send it to one of the buckets. At the end it moves the photos to the relevant bucket folders. I have now started to keep my photos all in a folder by year and subfolders of all events which I name with the ‘date - description’ such as ‘2015-07-30 Summer Vacation Holland’. This keeps everything in order. I know it’s tedious, but it really pays off! My greatest memories however I like to keep on a visual timeline. For example my childhood photos, images of vacations, living places, pets, children’s drawings, my collections of vintage fashion photos etc. I arrange on a timeline tool called ‘liniaa’. They just look great there and I can share them with my family. These tips are very useful. One thing on which I would like to get your suggestion is, how to deal with multiple camera sources when sub-foldering photos for organization. I tend to create a new main folder for each camera, and then under it sort by year, but would like a simpler approach. Zeeshan - You will probably find it best to put them all together, organized by date or however you set up your subfolders. Over time, you will have many different cameras, and knowing which camera took a picture will be less important than the content, date, event, etc. You didn’t mention why you separate them in the first place - but at any time, if you want to separate them out again, you can sort your folder of images based on file name or image size, which may be easy ways to group the photos from a cell phone vs. an SLR, for example. Meanwhile, if you are faithful about keeping the time/date settings current in your devices (phone, camera), you will be able to sort by “date taken” and see everything in chronological order, no matter which capture device you used. That can be very helpful! Thanks for your reply. This is a very good advice. Originally, when years ago I started sorting photos, I got into habit of sorting by cameras, and a separate folder of scanned photos. It continued afterwards when I had better cameras and smartphone photos, in order to keep separation between good quality photos and ordinary photos. However, now it has become almost impossible to manage unlimited amount of photos that I have, not to mention when I search for the ‘good’ photos which I know I had taken and viewed many time, can’t find where they were stored. I plan to get a new external hard drive and can experiment to throw all my thousands of photos on it, in one place under one folder. Then over the course of next couple of years I’ll see how it works for me. If you love your photo album and haven’t downloaded Windows 10—DON’T. The awesome feature of showing your tags in separate “folders” is gone! I’m sick about it. And, it takes forever to process the pictures folder. The sort by tag option does absolutely nothing other than take a lot of time. You can search on a tag name and everything will appear, but it’s not nearly as user friendly as when you could see all your tags in folders. That’s how I cleaned up the misspellings, dups, etc. Hopefully enough complaints with prompt Microsoft to bring back an awesome feature they trashed. I have over 25,000 photos in one folder. Think of it like a paper photo album. You put all the photos in order. Do the same on the computer. All my photos start with the same name—the date, year first, then month, then day, then time. Ex: 201508291641 for Aug 29 at 4:41p. Then the name you want to assign. And remember to tag the photo. Ex: 201508291641 - family beach vacation. The tags are: family, vacation, jimmy, susan, beach. Then if I want to find a particular photo later, I can go in date order or search by tag. Keeping all in the same folder makes it more like looking through an old time album. And, I scan in memorabilia as well and put it in the date order to be by the photos. Thank you for the great info. I have two questions. Will using the Photo organizer in PSE slow down the photo editing side of the software and do you have an opinion on ACDSee as a photo organizer? Barb, We are photo tools startup and I wanted to introduce to you Tru - a dead easy photo organizer that is effortless and automatic. It picks up all the photos from all your sources, de-dupes them and organizes them in a MMYYYY folder format that is easy to understand and universally acceptable. You can take it for a spin here: http://www.truorganizer.com - would love to hear your feedback. RE: How is everyone else organizing photos used for different purposes? I do not upload the same photos to my personal Facebook folder and Missy Ivey Photography. I keep them separated online and in my folders. Is that necessary? I have a similar question to Miss Ivey. At the moment I am using Photos for Mac. Although I may look at changing this. If i have edited some photos but still have the original. How do you guys seperate them out. Like an “edited” album. Or do you just throw the unedited ones into a big archive folder? Hi, great article! However my computer doesn’t have much space so I store most of my photos on an external drive. However I also want to use online backup so I can access ALL my pictures if I want to. I feel like my photo are everywhere: phone, Facebook, computer, external drive, some on Google Pics, some on Flickr. I want to consolidate everything, organize everything, backup everything, then have access to everything. I stay awake at nights thinking about how I’ll likely never do this before my kids are grown, then how will they see pictures of their life?! Do you a general suggestion on the order to go from camera (or phone, Facebook, Flickr, Google Pics), to external to online? Also there are likely thousands of duplicates that I don’t want to deal with. You can use Dropbox and a piece of software called Boxifier (http://www.boxifier.com/) to sync the files from your external drive to your Dropbox account. Once you have Dropbox installed and the folder with your images backing up to Dropbox, the process of backing up your files is automated. All you’ll need to do is transfer your files to your external drive. As for duplicates, we recommend Duplicate Cleaner (free at https://www.duplicatecleaner.com/). Help! Need an app for that. I have been desperitly looking for am APP for finding photos by my Photoshop tags on my tablet. I have over 6000 photos and would like the ability to find speific ones by tag. Problem is they all want to add tags after importing to tablet. Any sugestions? I am very interested to find a similar tool for Mac. At work on my Windows machine I use ImageRanger to keep the photos organized. This works great and I am totally happy. But I could not find anything for Mac.